May this year be one that brings you the desires of your heart! May it also grant me the desires of my heart too. When it comes to cars, the desire of my heart used to be extremely clear to me. I longed for a Peugeot 307 hatchback. For a number of years, I waited for the perfect combination of factors to come together so I could buy myself one. In the meantime, I would pass by the Peugeot showroom at Sarit, just to gaze at the car and…dream. Sadly, the perfect combination of factors is yet to come together. Tired of longing for the same thing for so long, other culprits have begun to steal my heart. The Toyota Vitz first caught my eye when a car dealer neighbor of mine imported a cute purple Toyota Vitz that he used to park outside the gate of our apartment complex. The car was a beauty! I had never seen anything like it and stopped one day to find out the exact make and model of the car. After that, I subconsciously kept an eye out for Toyota Vitzs in Nairobi, but noted that there were very few. A couple of months later, I got to experience the Toyota Vitz up close and personal when a good friend purchased one for herself…in gold. 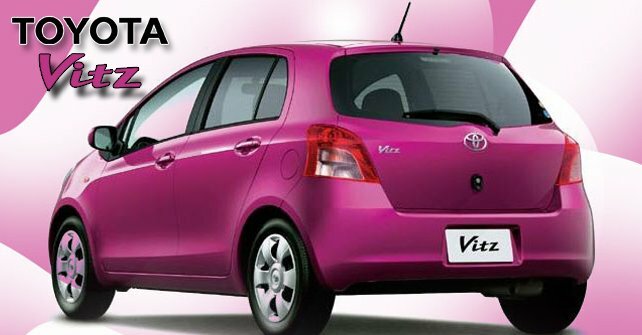 This color suited the Toyota Vitz even better than the purple I had seen previously! On closer inspection, what surprised me most about the Toyota Vitz, was how spacious the interior was. A couple of months after she purchased it, my friend and I put the spaciousness of the Toyota Vitz to the test during my friend’s next house move. We packed both our cars to the full, and within 2 trips, were done moving most of her stuff. Her car, especially with the back seats folded down, had great capacity. Another thing my friend often mentions about her car is how well it consumes fuel. She says that, on seemingly small amounts of fuel, her car just keeps going and going and going. Apparently, this is something the Toyota Vitz is popularly known for, as you can tell from the following articles: here and here. 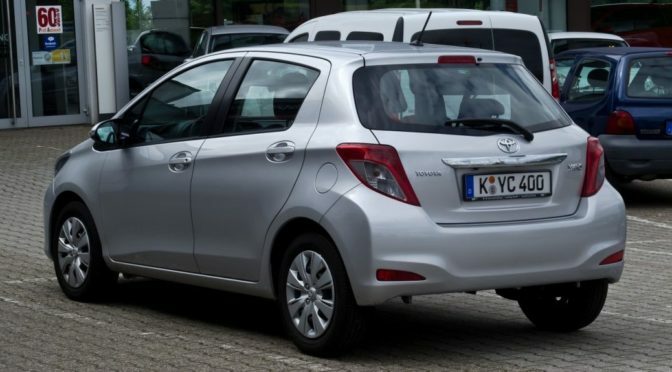 Although I will take her word for it, these write-ups, which include statistics on the fuel consumption that you can expect from a typical Toyota Vitz, might spell it out better for you. Last but definitely not least, what I like most about the Toyota Vitz is the fact that its, pardon my expression, perrr-tty (pretty)! Although I can’t firmly say that the Toyota Vitz is currently the desire of my heart when it comes to cars (my head turns too often when I see certain other makes and models pass by), it definitely has a spot on my car wish-list. What car do you favor? Thanks for a great review. It really is a wonderful car. Has been running for 3 years without problems. Thanks for your review too! It was quite useful while I was doing my research for this post. I hope to see more of you around ChickAboutTown. I do not like small cars dear, I tell you if I was ever to get on the road it would be by a Toyota Vitz driver who saw me staring at a beautiful Rangerover! …’get knocked down on the road….’ I meant. I don’t know where my head is today. I checked out your honesty scrap award post, and I did see that I was tagged. Thanks for the curiosity. Now, let me figure out what juicy morsels of my life I should share with you. Nice site…well i’m a 27yrs guy…thinking abt buying a vitz(clavia)..oops forgot its maroon in colour(they have classified it as “wine red”)would that fall into a “Chick car” category?? Lol. Not at all. Are you enjoying the car? Is it serving you well? I bought a newly imported VITZ with 1500cc, red in color, body kit (front and side skirts) I was amazed at how spacious it was inside. I am 6ft2 tall and fit easily. The price was steep. It was not my first choice but my girl would not have any other car but the VITZ. I tried to get her to pick a corolla, camry or sunny, but she said that those cars remind her of Taxi cabs (too common. Since I was buying for her, I gladly paid. She has never driven a car, so I had to drive it while she learned to drive. I drove the car to Kisumu from Nairobi and still had more than half a tank full. Despite the car having a bigger engine (1500cc)It takes only kshs 3000 to fill the tank. The car has a lot of power to climb the hilly roads, thanks to the new technology, VVTI engine. Please note that this car comes in three different engine capacities, the 1000cc,1300cc and 1500cc and the engine size dictates the price. I love the car. It is amazing. I have never liked smaller cars but this one is cool. Thanks for sharing your first hand experience with your (your girl’s?) Vitz! I was particularly interested to hear how it fared long distance. Enjoyed reading your blog. Just bought a Vitz-MY FIRST CAR!!! and absolutely loving it. I concur on it being spacious on the inside(I’m tall) and compact on the outside and the fuel consumption definite plus! Welcome to ChickAboutTown! And…congratulations on your FIRST CAR!!!!! Thanks for sharing about your experience with the Vitz. Hi, i have enjoyed your writings about the Toyota Vitz. I am interested in buying a Toyota IST, who has used one on the Kenya roads and what do i need to know about its fuel consumption, spare parts etc? Personally, I had never heard of the Toyota IST until I saw your comment, so honestly, I can’t be of any help to you. Maybe another reader? I GOT A PUPLE VITZ IN NOVEMBER 2010, I AM REALLY FOND OF IT,ITS MY PRECIOUS TRESURE FOR ME,ITS PURPLE AS WELL AND IT IS REALLY ECONOMIC,RUN SMOOTHLY AND HAS A VERY GOOD RIDE!! !I REALLY ENJOY DRIVING AND ITS MY HOBBY!!! Welcome to ChickAboutTown! Sounds like you are really enjoying your Vitz. Thanks for sharing. I’m glad I came across your review… I am looking to buy my first car. The vitz definitely wasn’t my first choice… But now I think I will seriously consider it. My dream first car is a toyota auris… But it’s way too pricey for my budget. I think the vitz will do just fine.